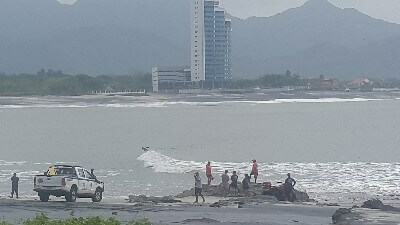 Sinaproc, Panama’s Civil Protection System, has issued a warning for Panama’s Pacific Coast urging people to avoid the beach from April 29th 2017 until May 7th 2017 due to waves and strong currents. According to reports over the next week we can expect waves of up to 3 meters high. The population is warned to pay special attention to rising tides and the presence of high and frequent waves. Sinaproc has asked that people obey warning notices and stay away from beach areas to avoid the possibility of sudden tide surges. The National Emergency Operations Center (COE), will monitor vulnerable areas like Puerto Caimito (Panama West), Playa Leona (Panama West), El Salado de Aguadulce (Coclé), Puerto Armuelles (Chiriquí), Boca La Caja (Panama City), Gonzalo Vásquez Island (Panama).